It's safe to say that Infinity War will be a large part of San Diego Comic-Con this year, even without Marvel Studios taking part. Fans will be keeping the Marvel Cinematic Universe alive through some pretty in-depth cosplay. We've already seen an epic mashup between Thanos and McDonald's icon Grimace, entitled Grimos, and now we have our first look at an incredible working version of the Iron Spider costume that Tony Stark gifted to Peter Parker. 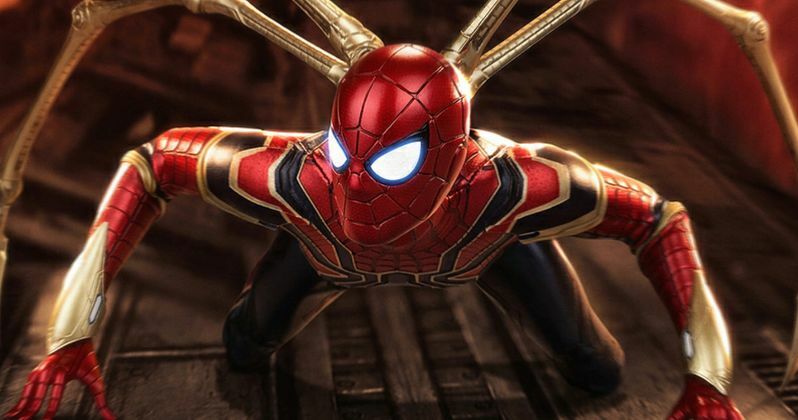 Dedicated MCU fans took a week to construct a working version of the Iron Spider costume from Infinity War. The group say that they were on a strict time budget to finish the suit in time for this week's San Diego Comic-Con, and it looks like they have delivered as evidenced by a video on social media. The suit features four extra appendages that all move, along with glowing blue eyes. If that wasn't enough, the suit looks remarkably close to the CGI Iron Spider that we saw on the big screen. While the Thanos and Grimace mashup cosplay is pretty clever, the new Iron Spider suit is a work of art that even the Russo Brothers would be able to appreciate. MCU fans will definitely be stopping the Spider-Man cosplayer for some pictures around San Diego this week, so hopefully Grimos and Spidey meet up for a photo opportunity as well, possibly to recreate the mighty snap at the conclusion of Infinity War. Elsewhere, a life-size version of the Mad Titan made completely from LEGO will be on full display at Comic-Con as well, so keep your eyes peeled for that. Cosplaying seems to keep getting taken to new heights for nearly every version of Comic-Con that happens throughout the year. There's been some pretty amazing Iron Man suits that look incredibly realistic and are even able to charge smartphones at the same time. The time and effort put in by these super fans is one of the best aspects about heading to a convention, and since Infinity War is the big ticket this year, one can expect to see some of the better known characters walking around the hall. Perhaps even a Tony Stark cosplay with a zip lock bag full of dust to represent the ashes of Peter Parker. San Diego Comic-Con starts this week, and as previously noted, Marvel Studios is sitting this year out to focus on Captain Marvel and Avengers 4. Studio head Kevin Feige promises that they'll be back next year to discuss the upcoming Phase 4 of the MCU, which will more than likely see the announcement of some new projects that may or may not include some Fox properties. That's still a year away, so try and enjoy this year's Comic-Con and go hang with the dudes with the Iron Spider suit and get some pictures. You can see a video of the Iron Spider suit in action below, thanks to the Lenses Factory HK Twitter account.